Join Molly's Revenge, Moira Smiley, and the Rosemary Turco Irish Dancers for a festive evening of music, song, story, and dance celebrating the holiday season. The performance features Christmas songs both old and new, from many lands, all played with a Celtic twist; the audience is highly encouraged to join in and sing favorite carols! Folk tales set in the winter season hold listeners spellbound, and the fabulous Irish dancers set everyone's toes tapping. 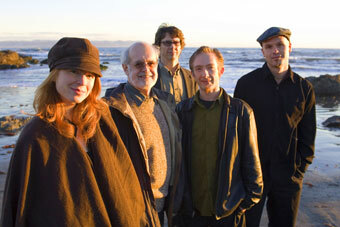 Molly's Revenge is a dynamic, acoustic Celtic band known for its unique and infectious enthusiasm. Featuring David Brewer (bagpipes, whistle, bodhran), John Weed (fiddle), Stuart Mason (guitar, mandola), Pete Haworth (bouzouki, vocals), and special guest Moira Smiley (accordion, vocals), the band's classic instrumentation and driving, hard-edged sound leaves Scottish and Irish music fans shouting for more. Molly's Revenge has performed at many of the top folk festivals and performing arts events in the USA, and prestigious events in Australia and China. Their CD Winterdance celebrates the timeless turning of the season at year's end; John Doyle, a founding member of the Irish supergroup Solas, produced their latest full-length recording, The Western Shore. Acclaimed vocalist Moira Smiley is an accomplished singer in many styles and has been a finalist in the All Ireland Singing Competition. Moira, who recently performed at the Freight with her visionary group, VOCO, also sang for years with KITKA Eastern European Vocal Ensemble. She has studied everything from classical piano to early American shape note singing, and currently works internationally as a vocalist and composer for dance, theatre, and film. Music from tonight's performance will be available on two CDs, YuleDance and WinterDance. A portion of the proceeds from sales of the CDs will be donated to the Leukemia and Lymphoma Society, the Aplastic Anemia and MDS International Foundation, and the ALS Association. Moira will be teaching a workshop, Anglo-Celtic Song with a Pinch of the Balkans, at 6:00 pm.